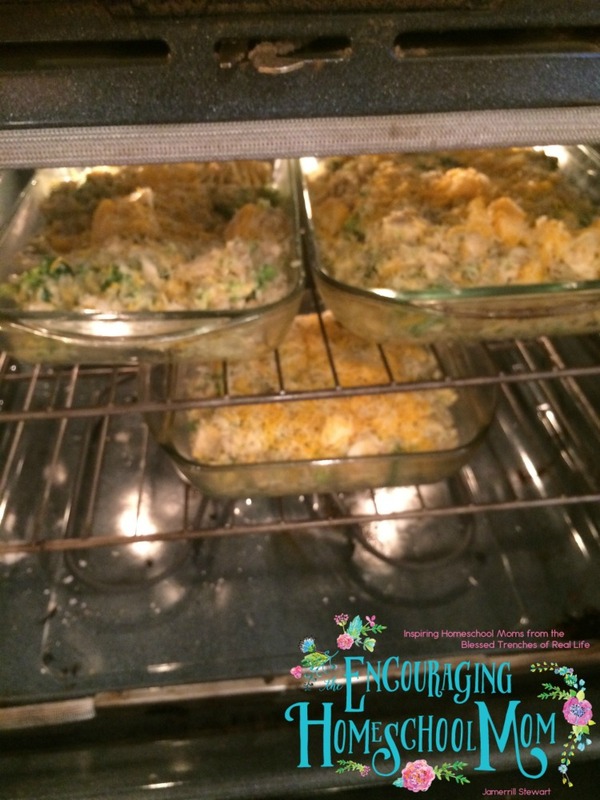 Chicken, Broccoli and Rice Casserole|Large Family Style! 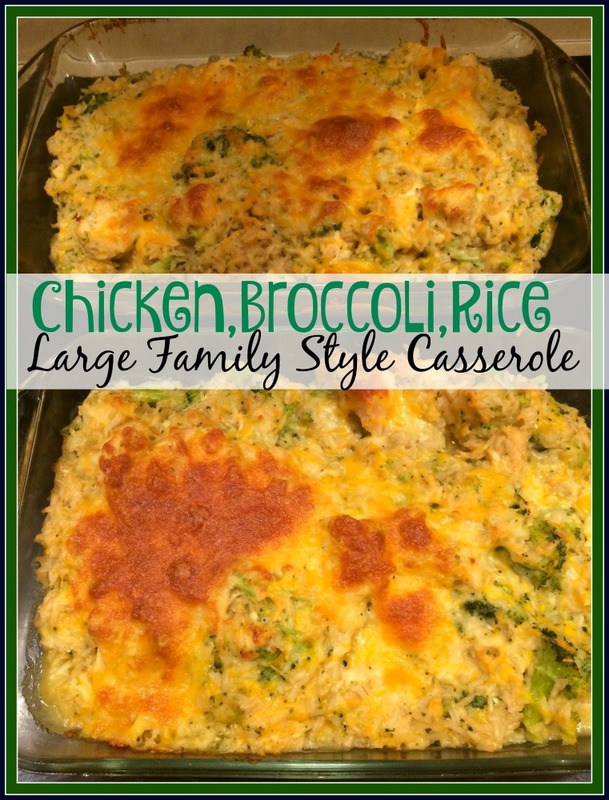 Chicken, Broccoli, and Rice Casserole | Large Family Style! Chicken, Broccoli, and Rice Casserole is a favorite around here. I make it once a month, of course making enough to have it for dinner twice. You can switch it up and make it work for you. This is a super simple bake that you can pull together at the last minute if need be. Or you can make several panfuls for future freezer meals. I like to get my rice done in the slow cooker and my chicken cooked ahead of time. This way I can mix it all together and shove it in the oven well before dinner. However, on this particular day when I filmed I didn’t have anything cooked ahead of time. It still came together great in a time crunch! This recipe makes 4 to 5 9×13 pans. Precook 4 cups of brown rice any way you can. Cook it in the slow cooker, rice maker, boil it on the stove, the point is however you can get it done! 4 cups of raw rice ends up being about 8 cups of cooked rice. I just love things that double in volume! Precook up to 4 lbs of boneless skinless chicken breast. You can also use chicken thighs, or chicken peeled right from the bone. Precook 4 cups of homemade cream of chicken soup. Of course, total GRACE if all you can do is pop open two cans of the store bought stuff. We’re all doing the best we can! I have full directions on making Homemade Cream of Chicken Soup in this post. Mix together 8 cups of cooked brown rice, 4 cups cream of chicken soup, 24 oz steamed broccoli (I used the steam broccoli packs from Aldi), 5 cups shredded mild cheddar cheese, and up to 4 lbs precooked boneless/skinless chicken breast in a large bowl. You can also add-in 1 to 2 cups of sour cream if you’d like. I didn’t do that in today’s video, only because I was out. Once everything is mixed together just fill your casserole dishes with the yummy mixture. Sprinkle a handful of shredded cheese on top of each casserole. Place your casseroles in your preheated oven at 350 degrees for about 30 minutes. Once your Chicken, Broccoli, and Rice Casserole is complete let it stand on your stove or counter to cool slightly before serving. The cheese will be hot, but it will be wonderful! Set the desired pans of Chicken, Broccoli, and Rice Casserole out in the refrigerator the evening before you’d like to serve. Place Chicken, Broccoli, and Rice Casserole in preheated oven for 1 hour or until bubbly and hot. Remove the last layer of foil and allow to cook for ten additional minutes. Allow your hot Chicken, Broccoli, and Rice Casserole to slightly cool on counter for 5-10 minutes before serving. If cooking your Chicken, Broccoli, and Rice Casserole from completely frozen (this happens in real life :), remove plastic wrap and one layer of foil and place frozen Chicken, Broccoli, and Rice Casserole in preheated oven at 400 (oven temps may vary). Cook for up to 1 1/2 hours or until hot and bubbly. Remove the last layer of foil and cook uncovered an additional 10 minutes as needed. 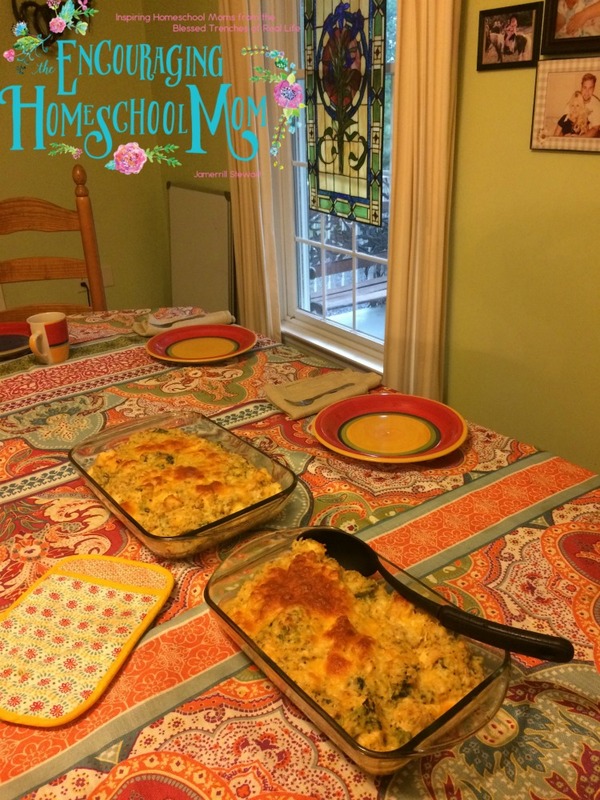 Click here to watch the full Large Family Recipes | Cheesy Chicken, Broccoli and Rice Casserole video! I just LOVE your recipes that you share with us. So simple and easy to throw together, but tasty and nourishing for our families. Thank you so much. Please, please share with all of us: Crockpot rice? How do you make rice in your crockpot. I am a in love with my crockpot, but have never heard of this. I am so intrigued on how you do this. I put 4-6 cups of rice in the slow cooker with 8-12 cups of water (double the cups of water of the cups of rice — clear as mud?). Cook on high for about 3-hours. I’ve wanted to get a video up about it 😀 Thanks for watching! Ah, Jamerrill….thank you. I am going to try this. I usually use my big rice cooker and cook up several batches, then freeze the rice in usable portions for later. I am SO going to try the Crockpot method. Also, based on one of your other posts, I just bought your 8 quart crockpot today. I really wanted an extra big one and the price is really good. I am excited to cook some big batches in it very soon. I love these quick and easy recipes! Please keep them coming. I do have a question…do you cook the broccoli before adding it to the casserole or do you put it in frozen? In this video I used the steamed broccoli bags from Aldi. I put them in the microwave based on their directions (few minutes.) The broccoli was steamed perfectly! Otherwise I would have boiled the broccoli first 🙂 Thanks! 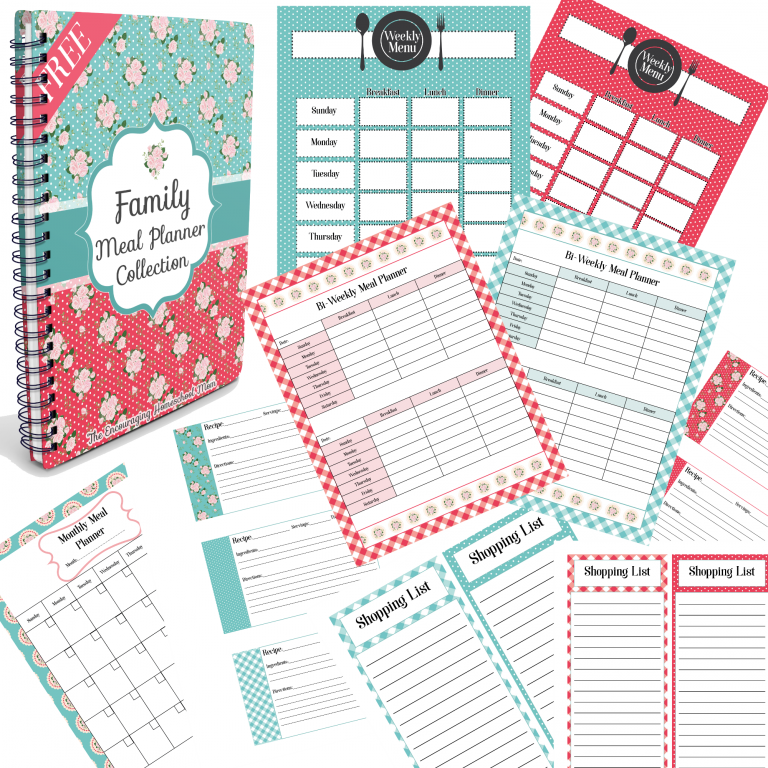 Hello and thank you so much for the meal planning collection. I like the way it is laid out and I am putting it to use starting this evening. I just recently found you on YouTube and wish it had been years ago. I homeschooled our daughter from day one all the way through graduation. She is now 25. I would have loved your encouragement back then and I surely love it now. You are always very uplifting and positive and I love to see your smiling face. It makes my day brighter so thank you for all you do! ps I love your kids and goofy Lab too. Thank you for another mouth watering recipe! Yes, and it freezes very well, too! When you freeze it, do you do it before baking or after baking and cooling? How many 10 oz cans of cream of chicken soup do you think your recipe makes? Do you please tell me how many people this recipe feet, and do you happen to have the nutritional breakdown of this recipe? If I use can cream of chicken soup should I add water to it? How many cans and how much water?